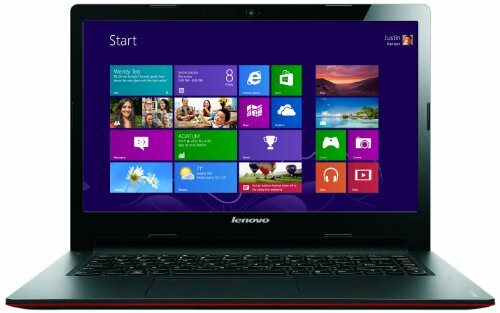 Below is our review of the Lenovo Ideapad S400, a 14" laptop, featuring 4GB RAM, 500GB hard drive and Windows 8. Situated somewhere between a net book and a laptop, the S400 "slimbook" offers a 14" display with a resolution of 1366 pixels by 768 pixels, in the 16:9 widescreen format. In theory it should offer the best of both worlds - small enough to be ideal for travel, but with enough room inside to give a bit more computing power, as well as a slightly larger and thus more functional display. Either way, graphics appeared sharp, and colours were rich and vibrant - no issues here. Finished in an unusual red colour scheme, the S400 definitely stands out from the crowd. The majority of it's similarly priced rivals are for the most part finished in a more traditional black or grey colour scheme - this tends to look more orthodox and will look less dated. Lenovo have evidently decided that enough customers will have a love for the colour red to manufacture this model in that colour scheme, and for the most part our testers liked it. Inside you'll find the Intel Pentium B997 1.6GHz Processor, which is coupled with 4GB of DDR3 RAM and an Intel HD Graphics 4000 graphics card - these helped keep this slimbook running smoothly, with the Windows 8 Operating system loading fast and running well. Multi tasking was handled pretty well especially considering the relatively low price tag of this notebook. Storage space is 500GB - provided by a 5400rpm hard drive, which provided fast access when both writing and reading data. Input is catered for by a decent size keyboard, which spans the width of the notebook. Understandably there is no room for a number pad - the overall dimensions of this notebook mean there would not be room without compromising the size of each individual key. The touch pad worked well, located slightly to the left hand side of center, and provided accurate input. As with most 14" slim laptops, there is no room for a DVD drive - however Lenovo have provided two USB 2.0 ports , one USB 3.0 port, a 2-in-1 audio input/output - headphone and microphone combination, HDMI output, as well as a 2 in 1 card reader catering for SD and MMC. So overall what did we make of the S400? And who do we think that it is aimed at? Lightweight, small, yet still practical - ideal for those who are often on the move. Depends on whether you like red or not! Overall, if you don't mind the colour scheme then there's no reason not to take a closer look at this notebook.